Sara James Emmy award-winning journalist. 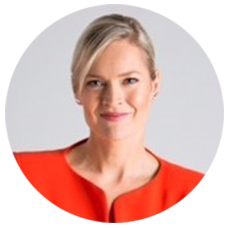 Sara James is an author, Emmy-award winning journalist and commentator who covers Australasia for NBC News and is a featured commentator on ABC news breakfast. She covers a mix of politics, business, culture and social issues. She has reported for Dateline, the Today show, and NBC Nightly News and these days calls the beautiful Macedon Ranges in Victoria home. In this 5 minute 20 second interview, Sara shares some of the insights she has gleaned during her career as a highly respected communicator. She generously reveals her top strategies which we hope will embolden more women and girls to step into public life. Next up on Engaging Women we meet Australian feminist Dr Anne Summers and broadcaster/author Tracey Spicer. Martine Harte: Sara many people would assume you were born a gifted communicator, is that the case? Sara James: I think I was born being fascinated by words and their power and wanting to have my voice heard, that was probably innate. But I definitely think that there was a lot of training of that along the way, in particular I think of a high school teacher I had who basically drafted a number of us into her speech team and we really didn’t know what that was going to entail. The next thing I knew, I was doing extemporaneous speaking and competing all over and that was incredible. We wound up going to the Nationals in the US from my public high school just outside Richmond Virginia, and really, what a gift! I think that was the beginning of realising that I wanted to be a communicator. Martine Harte: Fantastic, this is brilliant because we’re fiercely passionate about sharing strategies and skills to empower women to empower girls, to step into their power no matter what sphere they’re in. Do you have any strategies that you feel you’ve always been able to rely on? Sara James: Well I think it’s so important to share that teacher was great in terms of giving me opportunity. I remember it because when I was trying to get to the network and I’d been passed over for really good reasons – probably partly because I wasn’t ready and partly because there had been a war and things were tight. And that window was to report and anchor overnight on NBC. Sara James: Exactly. And lots of people thought that was crazy –you’re going to work in the middle of the night, that’s so hard, you’ve got another really good job why would you do that? That was a really good break for me, because little did I know that in addition to all the people who are up at night: hospital workers, firefighters, police officers, mums, in addition so was the executive producer of the Today Show. And that’s how I got the call up to New York. So I am so aware that you have to look through the window, for the thing that doesn’t sound like it’s as exciting as the job you wanted to get but it may be a way to get to your dream. Martine Harte: Because you say, that we’re often so focussed on climbing the ladder and we need to be scanning the horizon, I love that. Sara James: Yeah, I really think we’re obsessed with going up and we miss everything that’s to either side of us and I think that’s super important. The horizon has a lot of opportunities and the reality is it’s not always possible for a variety of reasons to take that next step up the ladder. It’s not always possible to see what it’s going to be; but if you have a look around there might be an opportunity near you that’s going to give you another way, another path to where you’re going. Sign up here to be the first to watch Sara’s next insightful interview in this series. Next up on Engaging Women, we speak to Australian feminist Dr Anne Summers AO about her recent honorary doctorate and Tracey Spicer drops by. Sara was also the first network reporter to travel to the bottom of the Atlantic to the site of the Titanic for the NBC Dateline/DIscovery Channel special, Raising the Titanic. Big thanks to filmmaker Paul Muir for his exceptional production. Posted in Interviews Engaging Women, Video. Tagged in American women journalists living in Australia, australian women speakers, Engaging women video content, video content, women in leadership, Women in media.